Choose a brightly coloured orange skinned and fleshed pumpkin for this dish. 1 Preheat oven to 180°C (350°F). Carefully cut pumpkin in half and scoop out seeds. Cut into wedges and rub with olive oil. Put pumpkin in a shallow roasting tin lined with baking (parchment) paper. Season with salt and pepper. Bake pumpkin for 15 minutes. The pumpkin should nearly be tender at this point, just offering a little resistance when you insert a knife into the flesh. (Dense-fleshed grey skinned pumpkin will take longer to soften; turn pieces over and continue cooking until nearly tender). 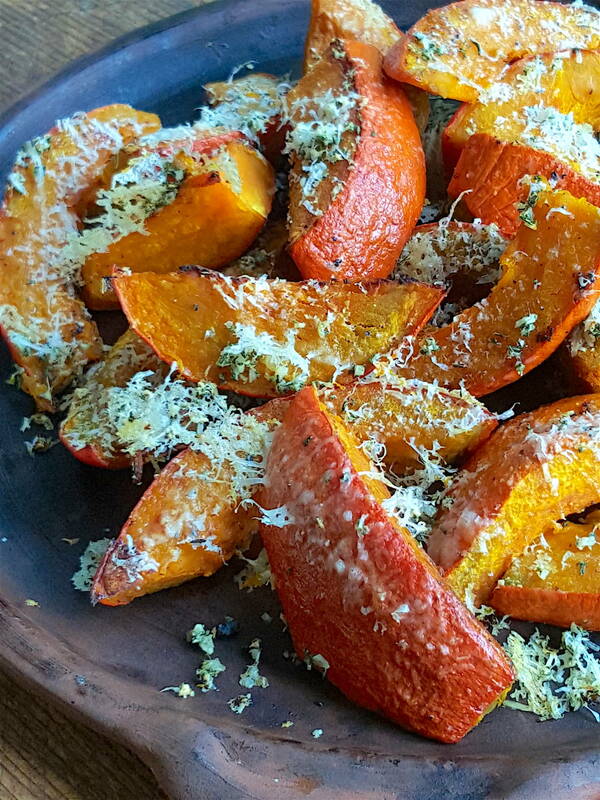 2 Remove pumpkin from oven, turn pieces over and sprinkle with garlic, rosemary and parmesan cheese. Return pumpkin to oven and cook for 7-8 minutes, until the cheese has started to colour and the garlic is no longer raw. Serve hot or at room temperature.